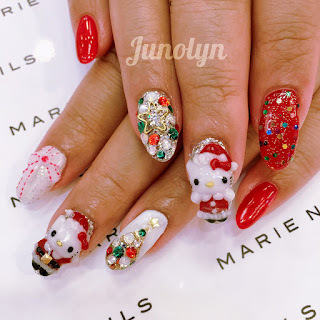 When I got my nails done with a Christmas theme, I never expected the results to turn out so good. My nails sparkle like Christmas time -- corny as it may sound. I feel like I am carrying around Christmas lights everywhere I go with the nails shimmering in red and green. Ever since I got my nails professionally done by nail technicians, I have spoiled myself that I can never go back to painting my own nails for special occasions. I feel all pampered and girly after getting my nails done. It's a girl's right of passage to get all beautified. When I see my nails so detailed with 3D art, I feel like I can't just put stickers on it. It feels like the real stuff is adding professional art rather than stickers. I guess it's my nail preference choice that has guided me to Marie Nails. I am always searching for the best of the best. After each visit to the nail salon, I have realized that my nail designs started off very simple and progressed into a more detailed art design. A week has passed since my last visit and I am so in love with my nails. 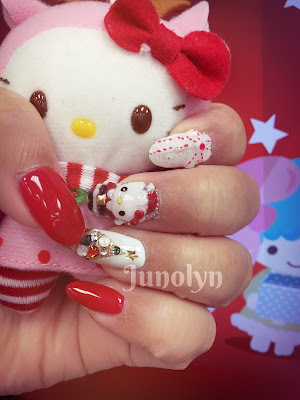 Earlier in the month, I knew that my theme would be a red Hello Kitty Christmas nails. I loved my Halloween nails and wanted to have a similar design. I thought that having a full figure of Hello Kitty instead of just the head would be fascinating. I was right. I loved the Santa Kitties on my hand. Each in a different Santa theme outfit.